Wow – the marathon is over. I will have a full recap sometime this week but in the interim, here’s my marathon training recap from my final week of training. 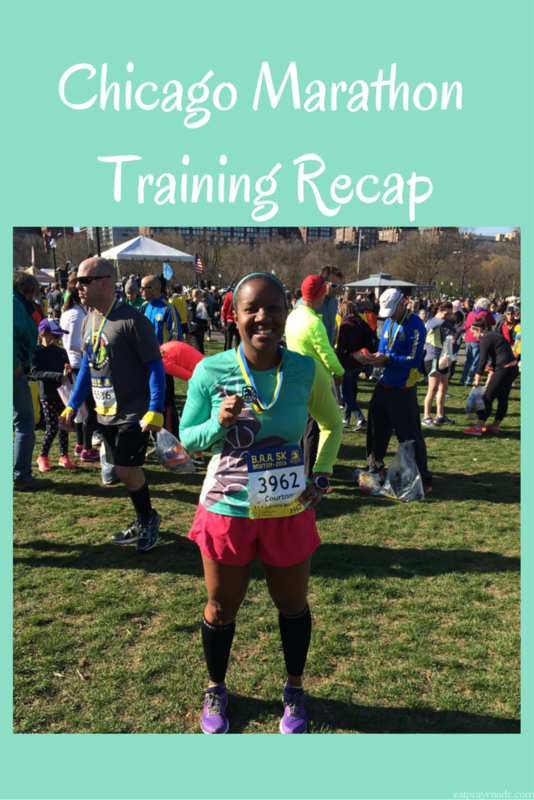 Each week during this training cycle, as I trained for the Chicago Marathon, I shared how my training went and what the week looked like. I did this because: 1) I love reading about how other folks train and 2) it’s great for me to have a record of what I did each week. Also, honestly, it helps keep me accountable when I know I’ll be writing about it. I also post almost all of my runs on Instagram as well. A few weeks ago, I started a link up for Chicago Marathon Training Recaps – I know there are more of us out there so please do link up! I love reading about folks training for the same race as I am, so please do link up! Monday: Five easy miles in which I discovered the Congressional Cemetery. Really beautiful and peaceful place to run (note: there are paved trails there and running is allowed – as is dog walking!). Tuesday: Four easy with Caitlin before flying to Chicago for work (and the marathon). Thursday: Four rainy miles at an easy pace. Friday: Two very easy miles over to Grant Park to witness them setting it up for the race. Eek! Saturday: 3.6 shakeout run with Bart Yasso and Runners World. Super fun easy miles. Sunday: The Chicago Marathon! Details to come in my race recap, but the general gist is below in this picture I posted to Instagram. I will also be sharing posts over the next couple weeks about running for RMHC, my thoughts on the Hanson Method for marathons and what is next for me! What a day. Felt great through 18 then experienced some pretty bad cramping. Managed to pull it together to come in just under 4:30 – thanks in part to support from my friends, coworkers and @oiselle teammates on the course. 21+ minute PR and all the feels. Chicago, you were beautiful. Now eating and drinking ALL THE THINGS. Did you race this past weekend? Tell me how it went! Congrats on your PR!! That is amazing!! I am sorry to hear you experienced cramping on the course but overall you did AMAZING! I am looking forward to reading your recap. Congrats! I am so glad you had a great race. I too had some issues on the course so I can relate completely, but I am glad that the cramping did not stop you. Too bad we were never able to meet in person. There was just too much going on with Team PAWS that I did not see my Oiselle teammates as much as I wanted, but I was thinking of you. Another time! That’s a huge PR! Congratulations! I obsessively checked your IG all day yesterday. I’m looking forward to reading your official recap. Big congrats on your big PR!! Sorry that you had some issues late in the race, but I’m so thrilled for your very strong training cycle and your ability to push through! Can’t wait to read all the details and hear about what’s next for you! Congrats on the huge PR and overcoming the cramping. It sounds like you finished strong! I know the race didn’t go exactly as planned but you trained hard. You had an incredible training cycle and it’s been fun to follow. The live tracking actually got really thrown off so was inaccurate a number of times while I was running. Thanks! So cool you ran with Bart Yasso! I just finished reading his book. Congrats on Chicago! Can’t wait to hear all about it. Rallying after something unexpected happens is something I can only hope I’ll be able to do. Hi Courtney! So funny that we traded places this weekend where I was in DC and you were in Chicago. =) HUGE CONGRATS on pushing through and PRing, despite those cramps!!! I know how hard it is to battle through but you did it with a vengeance. You are amazing! Can’t wait to read your full recap. And I hope my hometown treated you exceptionally well this past weekend! Congrats on your PR! Looking forward to reading your re-cap. Congrats again on your PR!! So incredibly awesome! I’ve only been to Congressional Cemetery once but haven’t run there–I’ll have to check it out!